Day by day the popularity of watches is growing over and over or we can say it becoming a fashion statement. Watches plays important role in human life, earlier we uses watches for just only timekeeping purpose or manufactured simple now it become a trend of life and watches are available in different brand, shape and technologies in affordable prices. The watch brand citizen largely producing splendid watches worldwide also they always brings unique watches having good material and stylish features. Citizen eco-drive, citizen chronograph, citizen perpetual calendar are some of the greatest example of watches in the collection of brand citizen. We have a beautiful extremely brand new citizen Eco-drive perpetual calendar chronograph watch for men’s, it used strong shiny stainless steel material in making the case and the bracelet of this watch. The working mechanism of this Citizenwatch is based on eco-drive technology, and powered by solar source therefore there is no need to change the battery of this watch long time. Eco-drive watches are also known as eco-friendly watches because they do not harm nature in any way. Ecodrive watches charged by sunlight or it can also works in deficient light accurately. The face of this Citizen Eco Drive watch is tapped by mineral crystal glass; this mineral glass is well visible in night and well tolerant to scratches. The dial of this watch is fully in white color, sub-dial also include on the dial of this watch. This watch has rotating bezel beautifully surrounds to the outer side of this watch it protect the face or enhancing the attraction of watch. This is chronograph watch with 1/20 seconds chronograph measures up to 60 minutes, also the chronograph watch measures the time in more than one way. 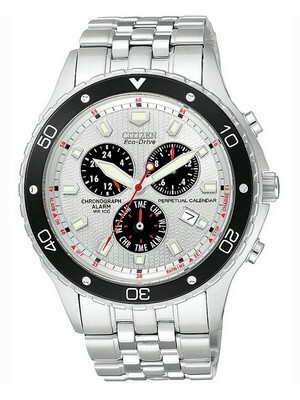 You can identify the chronograph watch have the features like alarm, stopwatch, power reserve indicator, sub-dials etc. This is perpetual calendar watch, a perpetual calendar watch display the calendar briefly. With this Mens Perpetual Calendar Watch you can easily see the calendar. The water resistant of this watch is to 100 meter. The case diameter of this Chronograph Men Watch is approximate 42mm and the case thickness of this watch is 12.30 mm. 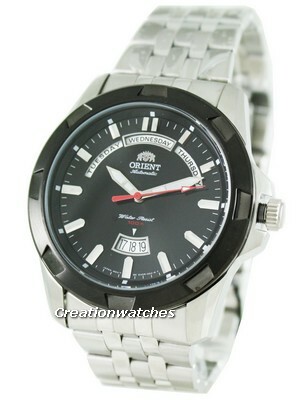 This watch is really appreciable and capable of making attraction in crown. This citizen watch is the finest timepiece from citizen in any way. This watch is available for US $228.00 with us.